Who needs roses and chocolates when you can get concert tickets instead? Back by popular demand, Ticketmaster and Live Nation’s 2 For 1 Concert Tickets offer features shows from some of your favorite artists on tour now. Yep, it’s the perfect Valentine’s Day gift! Grab a pair of tickets, invite your bae or BFF, and give the gift of a one-of-a-kind LIVE experience this year (your frugalness will be our little secret). To see participating events in the United States, click here. To see participating events in Canada, click here. Quantities are limited. Valid on select tickets for select shows only. 50% discount applied to face value of tickets at checkout. Additional fees may apply. Ends 10PM Local Venue Time on 2/16/18, or while supplies last. To search, make sure the Valentine’s 2 For 1 Tickets Offer is checked in the TYPE dropdown. All other ticket types are excluded from this offer. Can’t find the perfect 2 For 1 offer in your area? Don’t fret! We’ve got plenty of other Ticket Deals for you to fall in love with – yet another reason to ditch that boring old box of chocolates for a date night you’ll both remember for years to come! 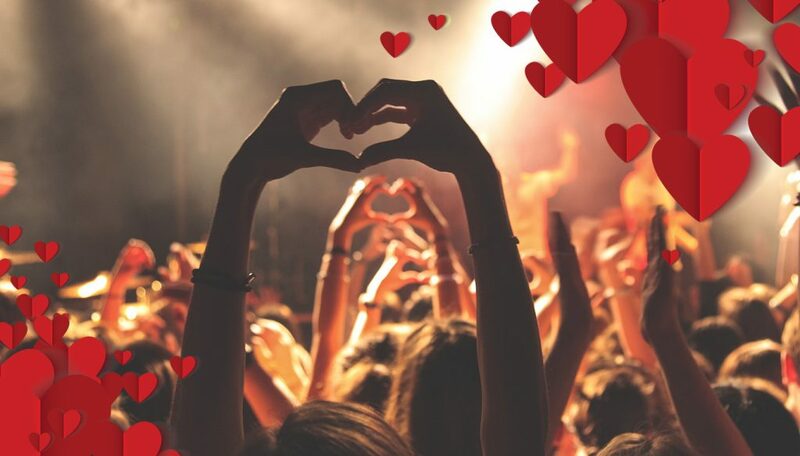 From all of us at Ticketmaster and Live Nation, have a happy Valentine’s Day. Originally published February 1, 2016.